Ben Coit is the Co-Founder and Director of Client Service for Sapient’s Nonprofit Practice – a dedicated group focusing on bringing the best commercial solutions in the market today to help nonprofits. In this role, Ben works with a cross-section of the public sector and not-for-profit world to connect these organizations with technology-driven marketing and strategy solutions that attract, engage and empower their target audiences. In addition to his role at Sapient, Ben serves at an Adjunct Professor at the American University Kogod School of Business where he teaches and lectures frequently on digital marketing. Connect with Ben on LinkedIn or Twitter. At the same time, these same people are targeted by award-winning campaigns from Fortune 500s at every moment, narrowing the window of meaningful interaction with your nonprofit. Given these complexities, consider the following digital trends and tips for using them to your advantage. Forget building websites; build mobile experiences. While it’s evident in many of our everyday lives that mobile has had a significant impact in how we work, live, shop and obtain information, mobile is still an area for growth for nonprofits. A recent study by Nonprofit Hub uncovered that more than 50% of nonprofits still lack a mobile-friendly website. Nonprofits must continue to invest in building digital tools that are optimized for mobile devices, making digital donations as simple as checking out at Amazon, and providing content in smaller, more digestible bits for users. While some nonprofits are still lagging behind in moving to a mobile-mindset, some organizations like the Nature Conservancy, World Wildlife Fund, and ONE are building responsive sites, content, and campaigns focused on engaging mobile users. Make personalized content your only content. As our reliance on mobile devices has grown, our ability to connect with brands and experiences has drastically changed. Users want a personal touch to nearly every digital interaction. Brands that help create authentic and personalized experiences are shown to have greater loyalty from their customers. Just look at Zappos: it feels like they somehow know what you want before you do. Zappos focuses on providing a personalized shopping experience for every visitor to the site. One way of building experiences that generate brand loyalty is through personalization. Nonprofits must find ways of personalizing their messages to help maintain a one-on-one, authentic experience with their donors. Using data gathered from website and social analytics, nonprofits can uncover information about their donors to build campaigns that feature unique, visually-inspiring content like infographics, videos, and other imagery that create a digital, personal connection. Charity Water does an outstanding job with their Dollars to Projects (D2P) by connecting each person and their donation directly to their mission. D2P helps create a personal connection to the individual by allowing them to see exactly how their donation was used and the impact it had. The resulting personal connection will keep people engaged longer with the organization and more likely to donate again. Staying relevant requires organizations to embrace change. Cyber Monday in 2015 saw mobile traffic to websites increase 16% over the previous year and accounted for 48% of all web traffic. Consumers ever-growing preference for mobile is here to stay and that means nonprofit leadership needs to get on board. Many of the nonprofits lagging behind in building mobile/digital campaigns and experiences are limited by leadership unaware of the dramatic mobile shift that’s taken place and how to address it. Thoughtful planning, a commitment to being open to new ideas, and investing in the proper training and tools for staff are a must to stay relevant. Nonprofits can solidify their relevance today and in the future by using the rise of digital and mobile technology as a way to help define, refine, understand the impact of, and analyze what you do and how you do it. 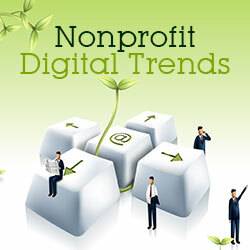 If you keep these trends in mind, commit to challenge the status-quo, and believe your nonprofit is not limited by what you can accomplish simply because you’re a nonprofit, this can be the year of your organization’s digital revolution. Nonprofit Hub, Nonprofit Website Survey.